The daily and weekly charts for IBM were setup for a positive reaction to earnings. Tuesday's close put the stock above my quarterly pivot with the weekly chart positive since Jan. 11. The daily and weekly charts for International Business Machines Corp. (IBM - Get Report) were setup for a positive reaction to earnings. Tuesday's close of $122.52 put the stock above my quarterly pivot at $122.46 with the weekly chart positive since Jan. 11. Charts favored a positive reaction to earnings. The price gap higher to the open of $131.37 was a gain of 7.2%, indicating upside potential to the 200-day and 200-week simple moving averages at $137.54 and $150.73, respectively. IBM has been a perennial member of the "Dogs of the Dow" and my call at the beginning of 2019 was to "Buy IBM Stock as It Begins 2019 as the Cheapest Dow Component". I made this call following a decline of 25.9% in 2018 as it was the worst-performing stock in the dog pound. Before reporting earnings after the closing bell Tuesday, IBM was already the best-performing stock among the dogs so far in 2019 with a gain of 7.8% year to date and up 15.7% since its 2018 low of $105.94 set on Dec. 26. Before earnings, the stock was still "too cheap to ignore," with a P/E ratio of 8.76 and dividend yield of 5.07%, according to Macrotrends. At the end of 2018, the stock had a P/E ratio of 8.00 and dividend yield of 5.74%. The stock closed Wednesday up 8.46% at $132.89. The recent acquisition of Red Hat Inc. (RHT - Get Report) is expected to drive cloud computing sales that are housed on IBM's state-of-the-art mainframe computers. Their cloud computing software applications will eventually take market-share from the cloud computing competitors that rely on a farm of smaller server computers. Their AI applications based upon the Watson platform seem to be making IBM more competitive in data analysis, mobile technologies and security. 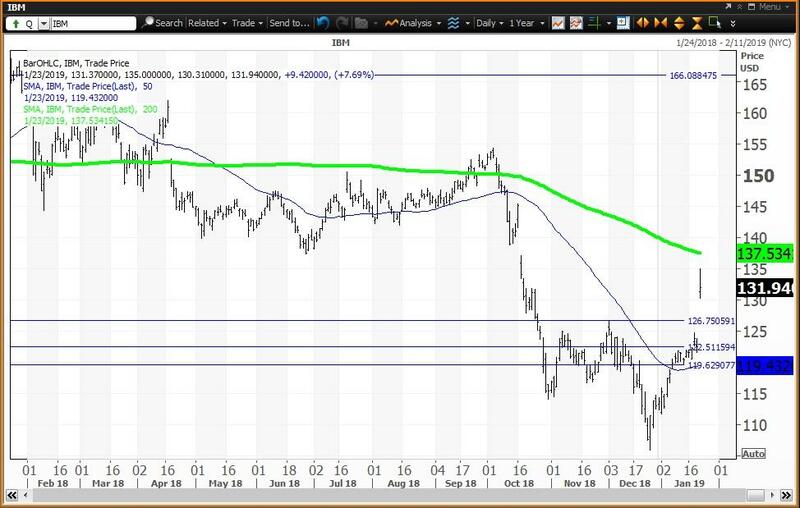 The daily chart for IBM shows that the stock formed a "death cross" on May 14 when the 50-day simple moving average fell below the 200-day simple moving average. This signal indicated that lower prices would follow and that investors should reduce holdings on strength to the 200-day SMA. This average was tested at $150.31 on Sept. 20 through Oct. 5, then the downside accelerated. The 2018 close of $113.67 was the input to my proprietary analytics and the results were new monthly, quarterly, semiannual and annual levels, which are shown as horizontal lines on the daily chart. My monthly pivot at $119.63 was tested on Jan. 8, leading the way to my quarterly pivot at $122.46, which was a magnet on Jan. 22 pre-earnings. The stock gapped above my semiannual pivot at $126.75, putting the focus on the 200-day simple moving average at $137.54. 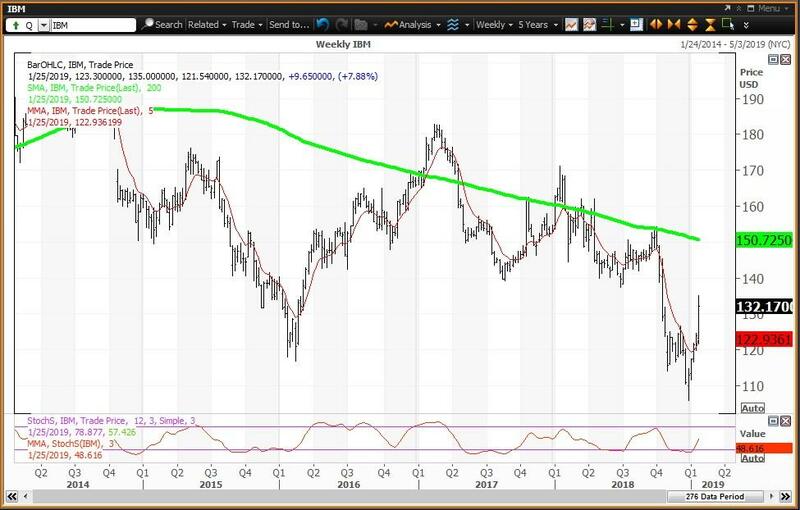 The weekly chart for IBM has been positive since the week of Jan. 11 with the stock above its five-week modified moving average of $122.89. The stock is well below its 200-week simple moving average or "reversion to the mean" at $150.72 last tested during the week of Oct. 5, when the average was $153.66. The 12x3x3 weekly slow stochastic reading is projected to rise to 48.56 this week up from 33.49 on Jan. 18. The stock began to rise above the oversold threshold of 20.00 at the end of the week of Jan. 11. Given these charts and analysis, my trading strategy is to buy weakness to my semiannual and quarterly value levels of $126.75 and $122.46, respectively, and reduce holdings on strength to the 200-day and 200-week SMAs at $137.54 and $150.73, respectively.